"God is the supernatural light of the soul, without which it abides in darkness. And now, in the excess of its affection, it calls Him the light of its eyes, as an earthly lover, to express his affection, calls the object of his love the light of his eyes. The soul says in effect in the foregoing terms, 'Since my eyes have no other light, either of nature or of love, but You, let them behold You, Who in every way are their light.' David was regretting this light when he said in his trouble, 'The light of my eyes, and the same is not with me;' and Tobit, when he said, 'What manner of joy shall be to me who sit in darkness, and see not the light of heaven?' He was longing for the clear vision of God; for the light of heaven is the Son of God; as St. John says in the Revelation: 'And the city needs not sun, nor moon to shine in it; for the glory of God has illuminated it, and the Lamb is the lamp thereof.'" - St. John of the Cross, Spiritual Canticle of the Soul and the Bridegroom Christ, Stanza X.
December 14 (Friday) is the feast day of St. John of the Cross. 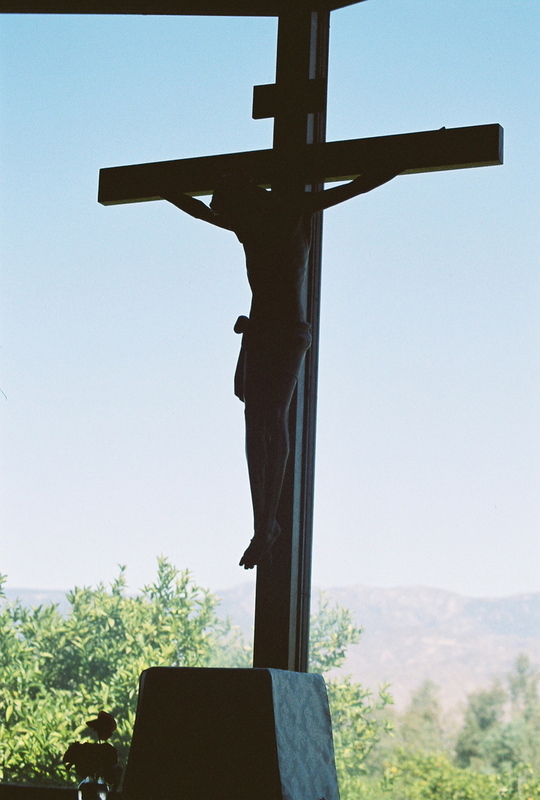 Picture: The crucifix in the chapel at El Carmelo Retreat Center, Redlands, California.